Despite the widespread lack of knowledge about ancient Africa and its place in history, dozens of recent finds are forever re-writing history. In the last decade alone, archaeologists have rediscovered ancient stone structures, evidence of advanced technology, manuscripts and inscriptions in various parts of the continent that continue to prove Africa was the birthplace of not just humanity but all civilization. At Abydos, archaeologists found the remains of a buried ship in a tomb complete with at least 120 depictions of ships. The actual ship measures roughly 65 feet long and the wall etchigs are as large as 5 feet long and include masts, sails, decks, rudders, oars and rowers. Because of its proximity to the tomb of suten Senwosret III, it is speculated that the tomb dates to at least c. 1850 BC. Read More. The remains of towns, cemeteries and evidence of vineyards were found following excavations by Polish archaeologists in the Letti Basin in Northern Sudan. At the Hag Magid site, they found columns, mud bricks, ceramics, pottery shards and paintings dating back 1,000 years to the medieval Christian Kingdom of Makuria. Read More. Although the Christian Church of Raphael was discovered a decade ago in Dongola, the Makurian capital, excavations only began in 2015. Since then, 1,000-year-old paintings depicting Mary, angels, priests, saints and Makurian authorities have been found along with inscriptions on a granite pulpit. Of particular note is one wall inscription listing the names of bishops of different Makurian territories as well as King Johannes who founded the church. Read More. Anthropologists from the University of Wisconsin found quartz tools from 100,000 years ago, providing more clues about early human civilization in southern Africa. The scraping tools are thought to have been used to make animal hides. Since quartz is not found below the surface of this site, it was likely imported from farther south. Read More. A team of researchers uncovered remains of a mixture of milk and ochre in the Sibudu Cave outside of Durban, South African, where the remains of modern humans dating from the same time period were also discovered. Read More. Tomb excavations in Aksum revealed the remains of a wealthy woman wearing a necklace, a beaded belt, bronze ring, with what looks to be a Roman bronze mirror that dates back 2,000 years. Apart from bringing more insight into ancient Aksumite culture, the find suggests Aksum traded with the Roman empire earlier than once believed. Read More. 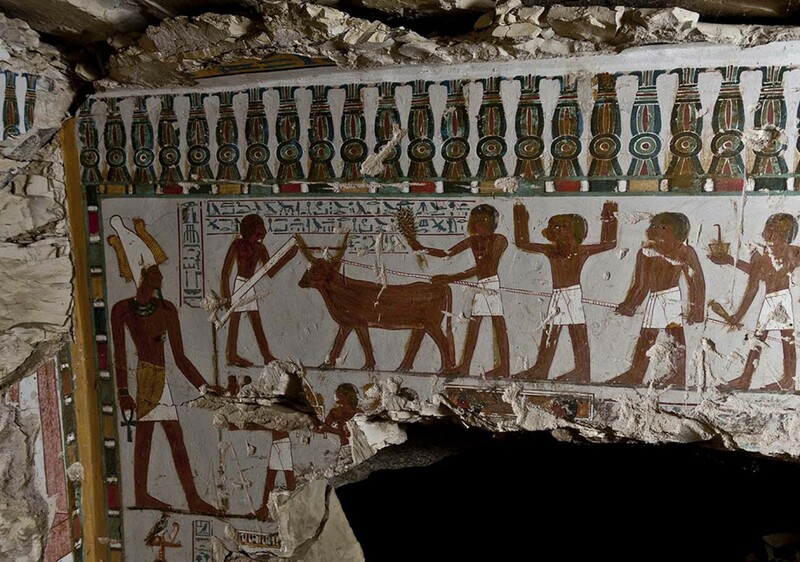 A tomb likely dating to the 18th Dynasty (1543-1292 BC) was unearthed near Waset (Luxor). While its colorful images of scenes of the tomb owner's daily life have been well preserved, the names of the owner and possibly the god Amun have been deliberately erased. Read more: Read More. Researchers from Kiel University have uncovered further evidence of agriculture practiced by ancient Kushites. Barley and wheat residue was found on the teeth of human remains in tombs that date back 7,000 years ago. The researchers, however, inaccurately assume that this find is the oldest known evidence of wheat and barley crop cultivation along the Nile. Read More. The German Research Foundation donated 1.6 million euros to continue the research efforts of the Institute of Archaeological Sciences for another three years. 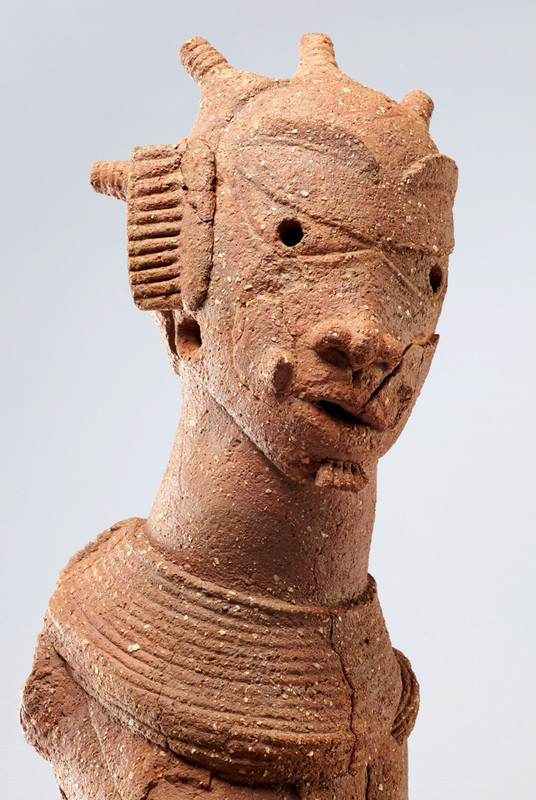 The results of the team's research and analysis will provide groundbreaking insight information into social structure, economy and iron smelting technology of the Niger Valley's Nok Culture, which dates back over 3,000 years. Read More. 55,000-year-old skulls of modern humans were found near the Manot Cave in Israel, the oldest ever found outside of Africa. The discovery, from a geographical perspective, lends more credence that the Nile Valley is the oldest migratory route of humans out of Africa. Read More. The discovery of medical records of construction workers at Deir el-Medina near Luxor (Waset, c. 1292-1077 BC) provides evidence of the world's oldest known paid medical leave practices. Among the documents were paid employee leave notices for personal and family illness and doctor visits for checkups, and attendance records indicating no docked pay for such absences. Read More. Skeletal analyses by Italy's Center for Sudanese and Sub-Saharan Studies at the Al Khiday 2 cemetery revealed ancient Kushites chewed purple nutsedge, likely as a tooth cleaner. The remains of the skeletons had teeth bereft of cavities owing to the antibacterial properties of the weed they consumed. This find rewrites history which largely assumes oral hygiene is a relatively recent practice. Read More. Polish archaeologists have identified evidence of permanent structures that date back 70,000 years at the so-called Affad 23 site in Sudan. The site includes a village of well preserved wooden structures, with a hunting tool workshop. Read More. 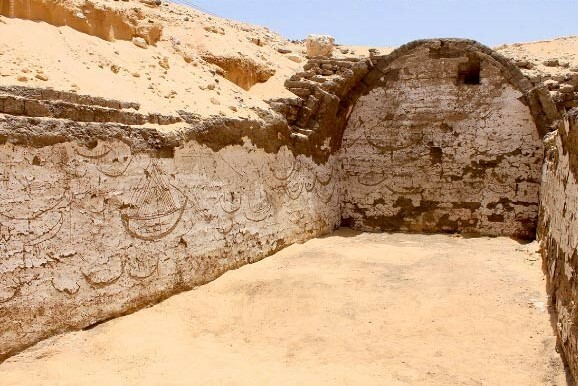 Polish archaeologists uncovering the remains of a large, brick monastery near al-Ghazali in northern Sudan located artwork and other inscriptions that date to the 600s AD on a wall next to a row of 15 toilets. This is the best known example of a large sanitary complex from medieval Nubia. Read More. Ruins of an ancient port and buildings dating from the reign of Menkaure (4th Dynasty, c. 2500 BC), who commissioned the third largest true pyramid in Giza, were uncovered at a nearby town where his pyramid builders lived. The find suggests Giza once had an extensive harbor. Moreover, the evidence of foreign pottery and juniper, pine and oak trees, which are not native to Egypt, confirms trade with regions of the the Levant in Western Asia. Read More.